Can you cook a steak or salmon filet that's straight out of the freezer and get good results? Ordinarily, I would say no. Usually your steak ends up a sad grey mass fit only for the family dog and the fish is burned on the outside with an icy, undercooked center. 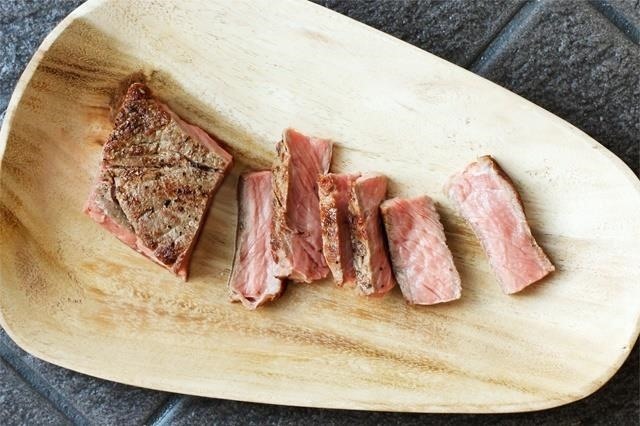 However, it turns out that if you know the right way to cook your protein and a few prep tricks, your steak and fish can actually be better if you cook it frozen rather than thaw it first. Of course, it goes without saying that cooking it fresh is always your best choice. 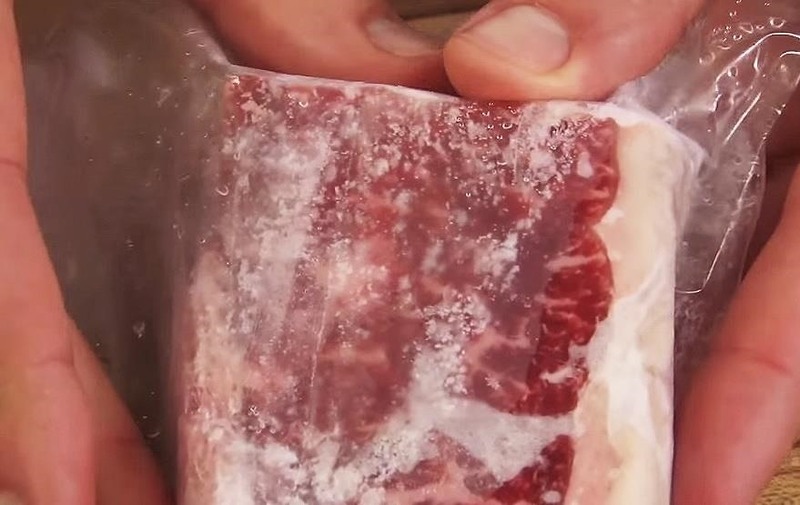 America's Test Kitchen asked if defrosting was necessary for a great-tasting steak. They cooked strip steaks from a defrosted state and a frozen one. Guess what? The frozen steak had better results, from appearance to taste. Want to learn how to do it yourself? Read on. If you want your frozen steak to cook up beautifully, you need to make sure it freezes flat so that the surface will sear evenly. You also want it to freeze so that little to no ice crystals form on the surface. That way when you sear the steaks after removing them from the freezer, the ice crystals won't start a small fire once they meet the hot oil in your skillet. 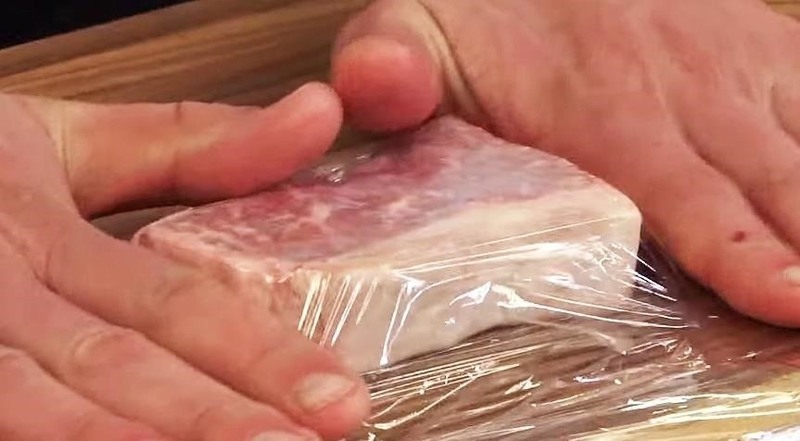 America's Test Kitchen recommends freezing your steaks on a parchment paper-covered flat surface overnight, which dries out the surface and ensures a great char. Next, wrap them in plastic wrap and put them in a zippered plastic bag so no excess moisture can form. You can also do an easy vacuum sealing process at home, which will have the same effect. 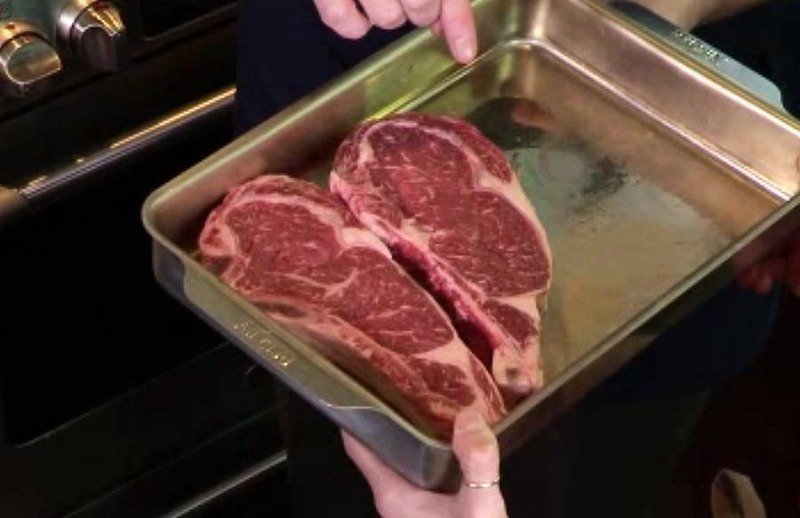 The clever users at Reddit pointed out that you can also take the extra step of brushing your steak with a layer of oil and/or salting or using a spice rub on it before you freeze it to add even more flavor. Put at least an 1/8th of an inch of oil in your skillet and heat it up. 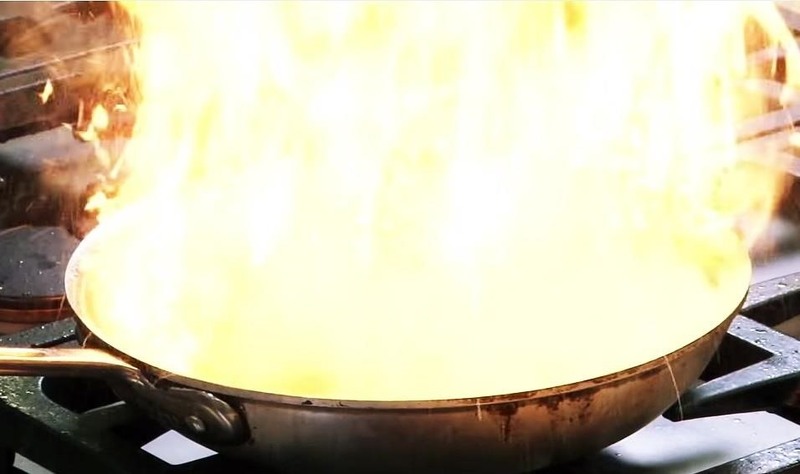 You need this much heated oil to counteract the chill coming from your frozen steak. Sear it for 90 seconds on each side until it gets that yummy brown crust. Next, place it on a wire rack set inside a baking dish with a rim. 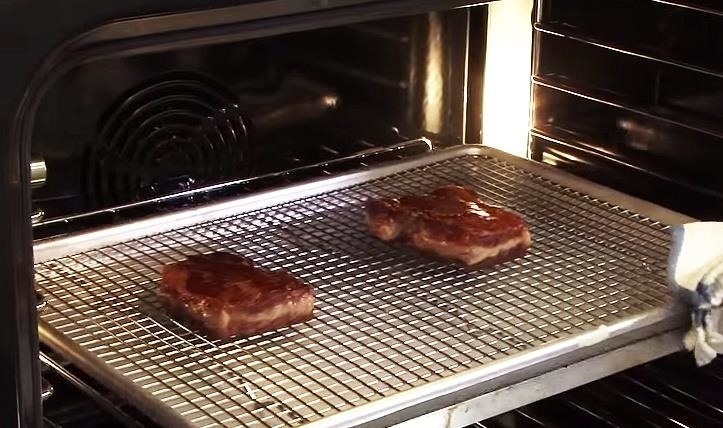 Cook for 18–20 minutes for a one-inch steak in a 275°F/135°C oven (that should yield a medium-rare steak, but use a meat thermometer just to be sure). 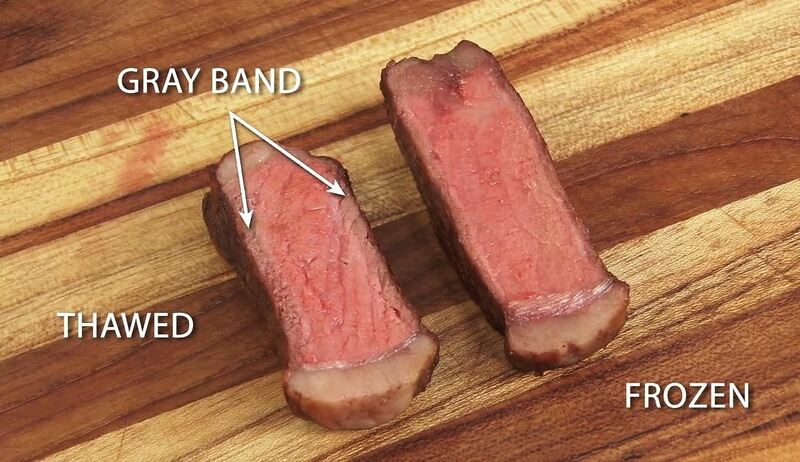 As you can see, the thawed steak ends up having a grey ring of overcooked meat around its outer edge right under the edge of that yummy crust, while the frozen steak has almost none. And while both steaks lost moisture during cooking, as is normal, the frozen steaks lost 9% less moisture. 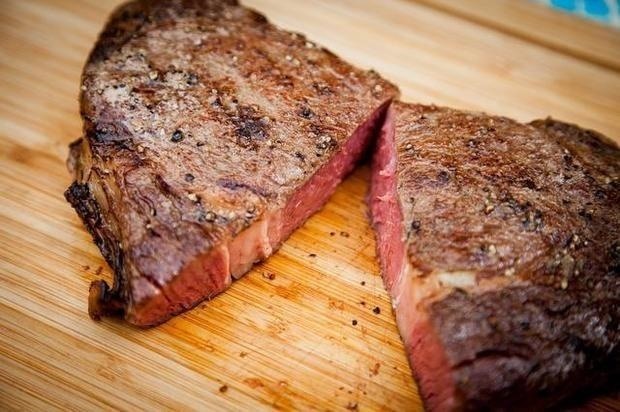 A frozen steak has an advantage because its inherent chill will keep the meat from overcooking while the surface is searing in high-temperature oil. A thawed steak, alas, has no defenses. 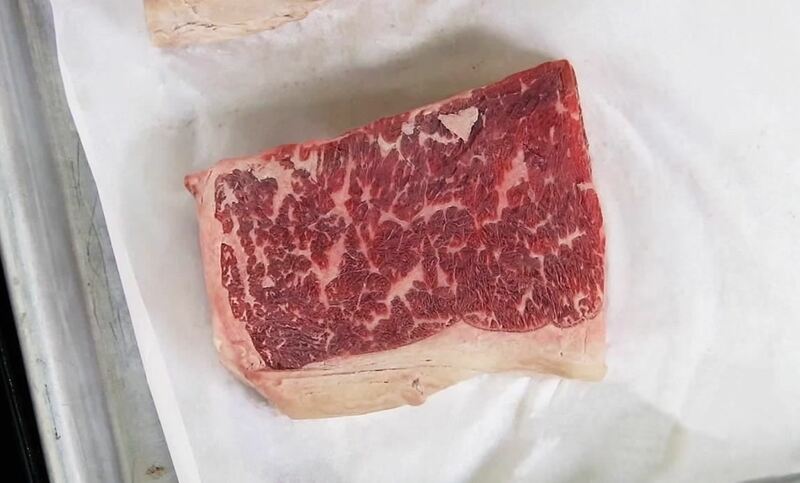 America's Test Kitchen also points out that when steak is cooked at temperatures of 140°F/60°C or above, its muscle fibers squeeze out more moisture. A colder steak means that there's less time for that to happen. See their full video and judge for yourself. 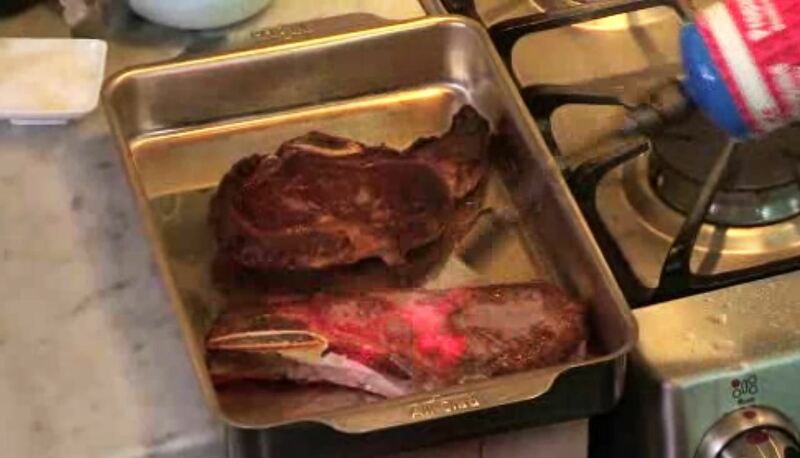 Nathan Myhrvold of Modernist Cuisine has another way to deal with frozen steaks. First, he freezes them flat on a baking sheet for half an hour (in a demonstration for The New York Times, he says overnight is fine, but cooking times may take longer). 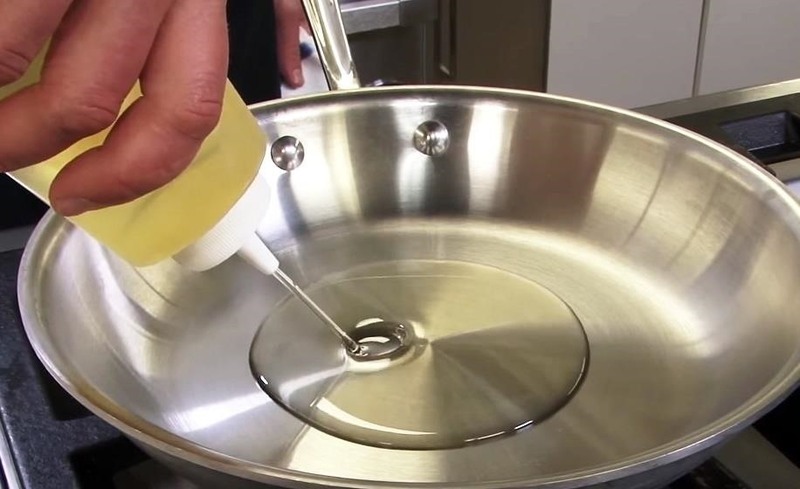 You can then brush each side with a neutral-flavored cooking oil. Next, he sears them on each side, using either a blowtorch or a hot, dry skillet. Then he bakes them in the oven (note: in The New York Times demonstration, he only sears one side of the meat in a hot skillet and places the unseared side down in the baking sheet), for 50 minutes at the lowest possible temperature. For most home ovens, that's about 200°F/93°C, although Myhrvold recommends going as low as 133°F/56°C. According to The New York Times, the results are spectacular: a charred, flavorful crust with a medium-rare center that is perfectly tender. The combination of an icy-cold steak and long, slow cooking in low heat prevented the meat from overcooking and stopped that gray ring of tough, undesirable chewiness under the crust from forming. Want to try it yourself? You can get the full technique here. 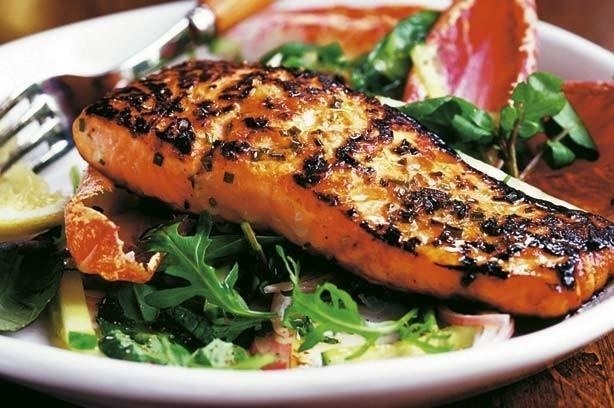 Over at Cooking Light (via Lifehacker), J. Kenji López-Alt explored the world of cooking with frozen salmon filets and loved the results. He observes that keeping the fish frozen ensures that the center doesn't get overcooked even as you get the outside beautifully charred, as with steak. Wild Alaskan Seafood points out that you need to make sure there aren't any ice crystals clinging to the surface of the fish before you fry, broil, sauté, or steam it. A quick rinse and blot with a paper towel should ensure that your frozen fish is ready to cook. 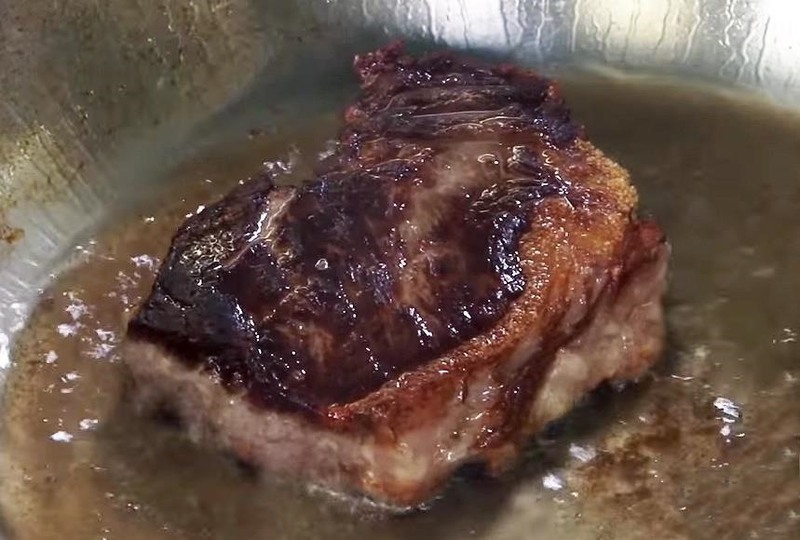 Learn other great techniques for cooking the perfect steak, from salting the skillet, not the steak, letting meat rest, and flipping it multiple times. You can also figure out how to buy sustainable seafood so that your frozen filets aren't contributing to overfishing. that first method is spot on i remember having to do that when i worked in a restaurant XD heh kinda making my mouth water from looking at it. seems like, results aside, it's a waste of stuff (to wrap it and otherwise prep it) and you dirty more cookware for a marginal change in taste/appearance.